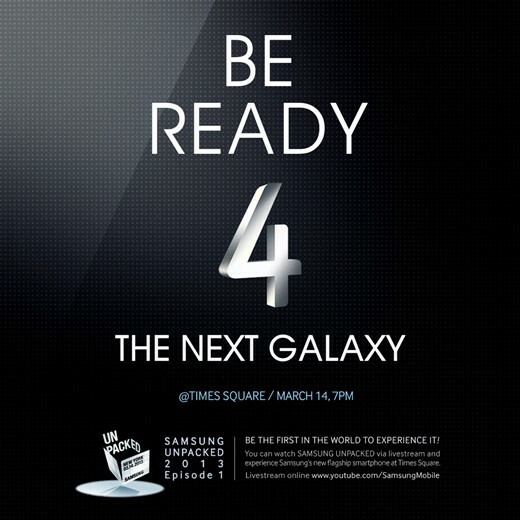 Few days ago, Samsung’s Twitter followers were told to be ready for the next Galaxy, Samsung Galaxy S4 on March 14. Whoever leaked the information that release date would be March 15 was not really far away from the truth. The announcement of the Samsung Galaxy S4 will be on the Unpacked event in New York on 7 pm EST. If you happen to be there, go to Time Square and watch the live streaming of this event. We expect it to be exciting and fun. What do mobile researchers say about new Galaxy? They suspect it would be delight and surprise for all those who are in love with smartphones. Could we be surprised and delighted by Android implementation, the size of the screen or super-fast processor. No. We all do expect it. Therefore, new Galaxy has to offer everything we are used to: brilliant large screen, LTE, the latest Android version, but we need to see some innovative additional features. Better use of the sensors when it comes to the camera, more than just taking pictures? The improvement of S-Voice? Something like that we can look forward to. And what are other internet rumors we have had an opportunity to read? There are some rumors that Samsung Galaxy s4 pictures leaked. Quad-core chip will be based on ARM’s A15 architecture. So, we can look forward to a big power boost for resource-requiring tasks. The second important rumor is that the flash memory would be faster, but smaller (in size). This means thinner mobile phone with faster flash memory and higher capacity. Sounds very goods, don’t you think so? Now we have to be patient and wait less than 2 weeks. After several weeks of the excitement, we will be focused on unlocking Samsung Galaxy S4 using codes (UnlockUnit), the same as we were interested in previous and still interesting and popular smartphones, S3 for example. For more information, visit UnlockUnit.com.